I could hardly believe my eyes when this new bath bomb, exclusively available in Oxford Street, hit by bath water. In front of my eyes a galactic rainbow appeared bringing with it a warm, comforting smell reminiscent of Christmas. If you're looking for adventure... you'll find it in The Experimenter. With a plethora of five bright colours, popping candy and Fair Trade vanilla absolute from near the Rwenzori mountains in Uganda, this bath bomb has it all. 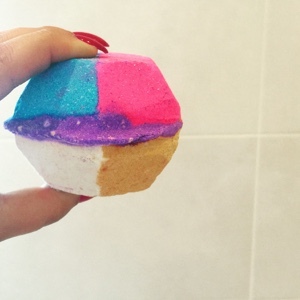 Described as a 'bath time motion picture', this bath bomb is a loud fizzer so takes time to fully dissolve, allowing you to enjoy the stunning visual display of colour. Once the ballistic has finally dissolved, you're left with a disappointing (yet great smelling) tub of dark grey liquid - which is rather anti-climatic after the colourful display. 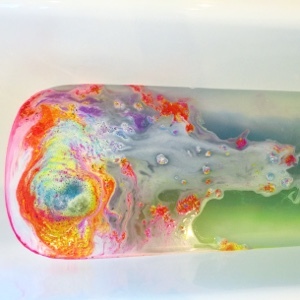 It's not my favourite bath bomb, but it sure is a show-stopper.